By entering the Good Housekeeping Kalahari Resort Sweepstakes at kalahariresorts.goodhousekeeping.com, you could win a getaway for six at one of Kalahari Resorts’ three locations: Wisconsin Dells, WI; Pocono Mountains, PA; or Sandusky, OH. 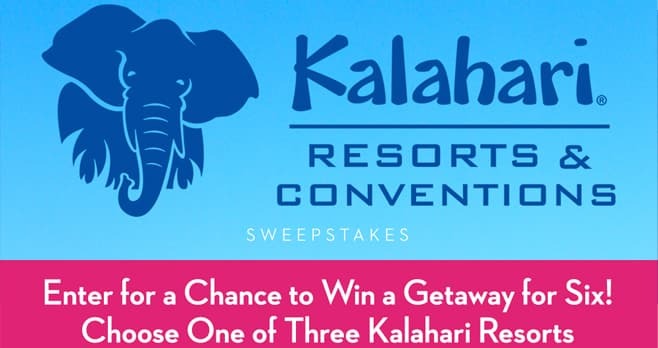 The Good Housekeeping Kalahari Resort Sweepstakes is open to legal residents of the 50 United States and the District of Columbia, who have reached the age of majority in their state or territory of residence at time of entry. Legal residents of Canada (excluding Quebec) who have reached the aforementioned age in their province of residence at time of entry are also eligible to enter. The Sweepstakes begins on March 1, 2019 at 12:01 AM (ET) and ends on April 30, 2019 at 11:59 PM (ET). Limit one (1) entry per person for Sweepstakes. The grand prize consists of a four (4)-day, three (3)-night trip for Winner and up to five (5) guest(s) to one of Kalahari Resorts three locations in an African Queen Suite. Visit kalahariresorts.goodhousekeeping.com to enter and see Official Rules for details. Please enter me in the Kalahari Resorts Sweepstakes. Thank you. Please enter me in the Kalahari Resorts Sweepstakes. Think you. My family would be so excited to win as this would be like a summer vacation for us. An actual dream come true literally as we have never had the means to travel any where during the summer. My mother took us to Great Wolf Lodge once for Christmas when my kids were younger, so I know they would love Kalahari Resort. Thankyou for the opportunity to apply in the sweepstakes! Please enter me in the Kalahari Resorts Sweepstakes. We sure could use a vacation right now. We sure could use a vacation. haven’t had a vacation in 10 years…would love to win this and enjoy times with my family!! Please enter me in the KALAHARI Resort Sweepstakes.. would love to WIN! Thank you! Would love to go to Kalahari Resorts. Never been there.